I think I will have finally caught up with blogging about all the hats I've made just in time for New Years-must try harder in 2014! This last one is a black felt pleated half hat, inspired by the styles of the 1920's. I made it on my malleable head block that I use for free form blocking, drawing the felt over from the left side to the right in several folds that are then pinched together at the right side of the face in a small pleated tail. I kept the decoration to a minimum of a satin binding as the silhouette is quite dramatic in itself and I didn't want to distract from that. Detail of the pinched pleats. During the 1940's felt flowers were a very popular way of decorating hats and making corsages and even jewellery as a way to cheer up wartime fashions. With rationing in full swing using up small scraps of felt to create flowers was an ideal way to add some much needed femininity to everyday life. I've made silk flowers and ribbon roses before but wanted to try out using my silk flower tools on felt as I had tried them on the felt leaves for my Autumn Leaves Hat and they worked rather well. 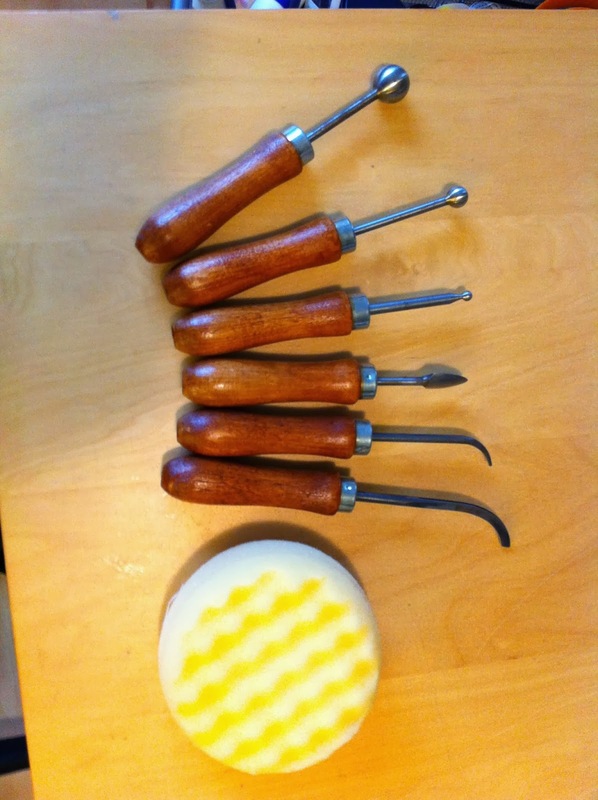 The tools themselves do rather look like instruments of torture, and you do have to heat them up so that they mould the fabric... The ones with the balls on the end are to form a cup shape in the leaf or petal in various sizes. The hooked ones and the shield shaped one are for creating veins and folds in the fabric. To help make the shapes the sponge is placed beneath the petal/leaf and then the felt is steamed with a wet cloth and an iron and then you press the shape into the felt with the tool -the sponge allows the shape to form. I made a lot of the flowers and leaves first and then spent quite a long time arranging them on the pillbox. I tried the in all sorts of combinations, in little groups all the way round, in two groups on opposite sides, all on the top, in a line across the top... But eventually settled for one large group on the side and top, on the right side of the hat. The flowers are finished with a black glass bead as their centre. I really like this little hat and shall definitely by making more felt flower as they are actually far easier than making flowers from silk! I made this trilby on a lightly smaller block than usual, as I wanted it to sit higher on the head than a normal headsize hat, its not a mini perching hat either-its somewhere in between! THe block was found for me by my lovely friend Ben who happened upon it in an antique shop and very kindly nabbed it for me for the bargain price of £40. 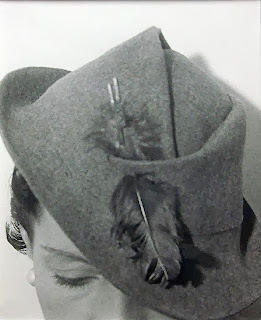 The pleating around the crown was inspired by a hat worn by The Hon. Daisy Fellows in Harpers Bazar in 1933- such a fab hat. I didn't make my pleats as big as the original hat and finished it with a twisted cord rather than a feather, as I prefer to go with what colour trimmings suit the felt and use up some of my extremely extensive collection of decorations... The lilac and cream combination is quite versatile and will go with lots of other colours. I hand blocked the brim as I don't have a brim block in this style and size-yet! It does take a lot more work hand blocking a brim but you do get more freedom over the finished shape. The rather jaunty snap brim. Close up of the twisted cord.